VICTORIA - The Royal British Columbia Museum discovered there's no honour among thieves as a pair of bandits made off with a collection of prized watches, including a gold pocket watch that once belonged to legendary train-robber Bill Miner. 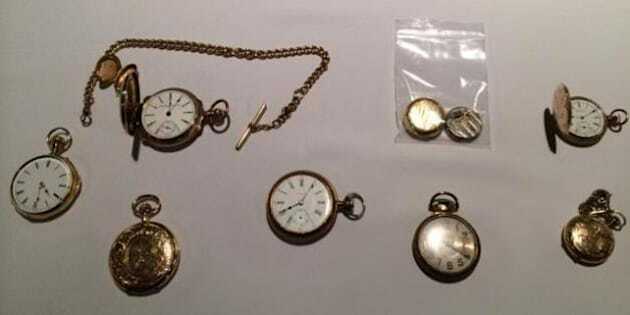 Victoria Police said Thursday they recovered the watches, including Miner's 1901 model, and man and woman face theft-related charges after their arrests at an apartment in Port Alberni, B.C. Sgt. Colin Brown called the museum theft a crime of opportunity by people who were likely looking to trade the watches for drugs or cash and didn't know or appreciate their historical value. Museum chief executive officer Jack Lohman praised the efforts of the police who used fingerprint evidence left on the glass case that held the watches and then worked their street contacts to recover the artifacts. Lohman said the watches date back to the turn-of-the-century and are extremely valuable to the museum for their historical significance, especially the time piece associated with Miner. "I don't think you can put a value on your own history, can you?" he said. "Clearly, people have an intent of selling these, but actually they're priceless." Lohman said the police cracked the case in less than a week. The theft was reported last Friday, the arrests were made Wednesday, and the watches were recovered in Victoria. "This collection is particularly important because it's early 20th century," said Lohman. "Particularly important are a number of these because they are linked to particular individuals with a strong background in British Columbia. Obviously, the most important of those is the watch that belonged to the American criminal Bill Miner," Lohman said. The collection is slated to become part of a Gold Rush exhibit the museum is planning for next year. Police said the watches were locked in a glass case on the museum's third floor. Brown said the fingerprints on the glass, and security and surveillance systems at the museum aided in the investigation. Lohman said the glass cover on Miner's watch appears to have been broken during the theft and is no longer on the watch. The seven other watches were not damaged. The first week of January is traditionally a busy time for the museum because it offers admission by donation to the public. Miner was an American-born career criminal who crossed the border into B.C. in the early 1900s and robbed at least two trains before he was caught and sentenced to 25 years in prison. He soon after escaped and fled to the States, where he continued his criminal ways until he died from natural causes in 1913 at the age of 67. Miner's exploits in Western Canada were chronicled in the 1980s movie "The Grey Fox." The RCMP's website describes Miner as a folk hero to many Western Canadians because of his "bold attacks on the unpopular CPR." The website says on Sept. 10, 1904, Miner and two accomplices, William "Shorty" Dunn and Louis Calhoun, were involved in the first train robbery in Canada, netting $7,000 after holding up a Canadian Pacific Railway car near Mission, B.C. On May, 8, 1906, Miner and his two accomplices, robbed a second CPR train near Kamloops, B.C., but three days later after a shootout with the Northwest Mounted Police, Miner and the others were arrested and brought back to Kamloops. Brian Gerald Holt, 44, of Colwood, B.C., is in custody and faces a charge of theft over $5,000 in connection with the theft of the eight museum watches. Holt's 29-year-old girlfriend, who was not named, was released from custody and is scheduled to appear in court at a later date.